January 1st – the day gym memberships increase and restaurants see a temporary dip in their profits as so many of us make resolutions to put ourselves on a self-improvement plan which most of the time includes weight loss. At the beginning of the new year, just about everyone I know has a new enthusiasm and determination to get back on track and get their weight off. So they make a New Year’s Resolution to do just that. The challenge for most of us when it comes to those resolutions is that all too often we quickly lose our focus. When we first make that resolution there is a brief focused interaction with our present reality. We admit we have a problem, we are fat! We know that we want to change for the better. Quicker than we can say, “pleasantly plump” our focus shifts to only looking ahead to where we want to go – that leaner body and that peak of optimal health. We lose sight that our present reality is where we must begin the process of change. It is the choices we make today – not those yet to come someday. If we fail to make a wise choice today based on the truth of our reality we will face disappointment and the frustration of feeling like we blew it…again. The problem is we didn’t blow it – we just never left the starting gate. 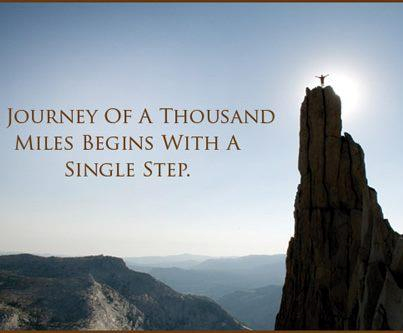 It is difficult to ever cross the finish line if we never truly begin. If your New Year’s Resolution went nowhere and now it is almost March, take this very moment in time to refocus on your most inner spirit’s desire rather than your taste buds or stomach’s tyrannical reign over your life. Take a deep breath and verbalize what you truly want for your life…is it really that half-dozen donuts with chocolate frosting? Or is it to be able to walk briskly without gasping for air? Or to be able to play with your children or grandchildren without every joint aching from the excess weight? Or is it to be able to pull on and fasten your pants without having to lie down to do it? Or is it to not have to take so many medications for the diseases that have accompanied our wrong choices? Or is it best of all to one day wake up and say “wow, I feel stronger and more alive today”? Regardless of whether you’re just getting started, somewhere in the middle of your journey, or dealing with the challenges of maintaining a healthy weight, the challenge for all of us is the same: to stay focused on what we want and continue to choose wisely. Taking care of ourselves is one of the most important things we can do to live a long, healthy life. Heart Health is extremely important in preventing heart disease, which can include stroke and heart attack. Regardless of your age, gender, or race, there are some very simple things you can do to take care of your heart and keep it ticking for years to come. 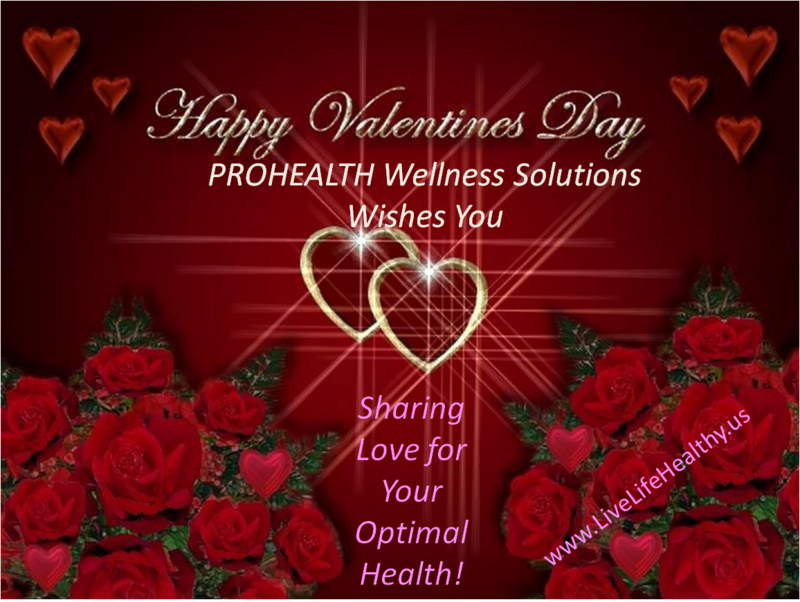 Come celebrate Heart Healthy Month with us February 14th “Valentine’s Day” to enjoy some delicious heart healthy smoothies!! 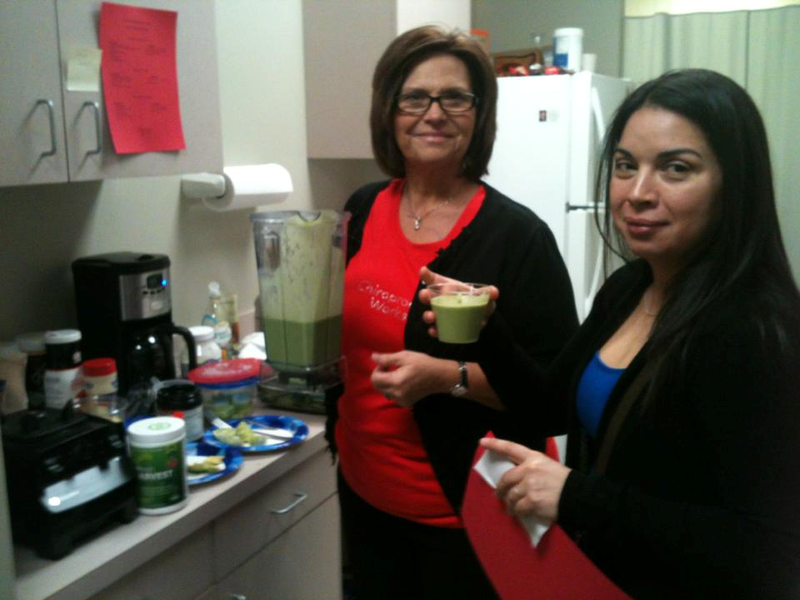 We will be making these smoothies all day for you in celebration of Heart Healthy Month and Valentine’s Day. Make sure you bring a friend or loved one to celebrate with us whether you have an appointment or just want to hang out and have smoothies! We truly “Care Enough to Share” these recipes with you as well, we will have some copies available for you to take with you! 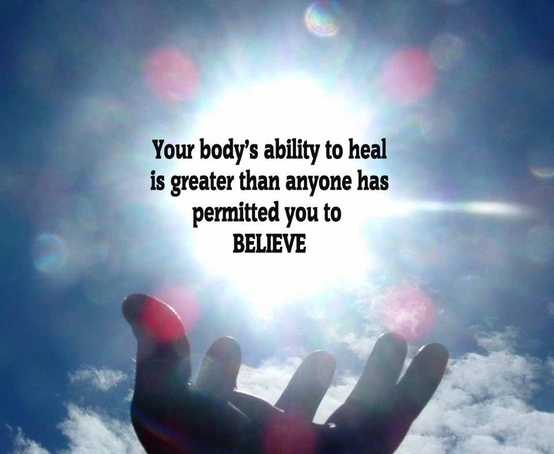 Did you know that this is what Chiropractic is about…enhancing your body’s ability to heal itself. Your chiropractor, no matter how wonderful they are, does not heal you, but they do equip you to heal yourself. Detecting and correcting subluxations, spinal nerve interference, unhinders your body. You are set free to tap into this magnificent innate ability that our creator God endowed in each one of us. It is so much more than relief from an aching back or headaches. God designed you in His own boundless image — not the fettered & limited version we have in our head or by which we’ve been indoctrinated by others and the world. Wouldn’t you like to know what you may have been missing? Don’t just roll over and accept the limits of your circumstances or your thinking. Be free! Get your spine checked. A new way of life is eagerly awaiting your discovery. What have you heard about Chiropractic care? If you have never been to a chiropractor or know someone who never has, you’ve probably heard more than a few myths about it. You may have even believed them. Many people just have a fear of the unknown. Let’s look at just 5 of the top myths in this chart and bust them open. If you have any other questions please give us a call 281-991-7676 or email us at prohealth_dc@yahoo.com. We love explaining how chiropractic can help you! Call 281-991-7676 for your Chiropractic MythBusters at PROHEALTH Wellness Solutions and make your appointment today! We are open New Year’s Eve day from 3:00 PM to 6 PM. We wiill be closed New Year’s Day. Normal hours resume Wednesday afternoon January 2, 2013 . Let’s finish 2012 in the best style there is – optimal health! 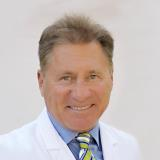 Is Your Doctor An Artist? Is your doctor an artist? That may sound like an odd question and one that I can hear you saying to yourself, “I could hardly care less if my doctor is an artist”. So why should you care? You should care, because the answer may totally be affecting your health and therefore also your quality of life. Many traditional doctors only assess you, their patient, as one unit among many. They put aside any sense of art in your diagnosis & treatment and practically deify the science, a science often based on questionable big company research. Non-artist doctors have locked away palettes & paints in exchange for pharmaceutical “one size fits all” solutions to what they only see as biology or at best biochemistry. They have taken a magnifying glass to examine the paint on a canvass and never gazed at the picture as a whole. An artist doctor sees his clients and the world differently. You are unique and an individual. The body you wear day after day carries its own inherent characteristics. You are an original design…a special edition! You are the greatest portrayal of art ever! That said, why would you ever want someone who will not see the art, treat you as only a biological science experiment. The phrase the “Art and Science of Chiropractic” is unique to the field of Chiropractic for a reason. A good chiropractor doesn’t eschew the science over the art or vice versa. Both are important factors in attaining optimal wellness. Chiropractic appreciates the role of the nervous system as the master controller of all cells, tissues and organs in the body and how any irritation or interference will hinder communication within that body. Rather than treating a specific disease or condition, Chiropractic focuses on removing any of the interferences, such as subluxations, that inhibit the innate ability of the human body to heal itself. The detection of the vertebral subluxation and deliverance of the chiropractic adjustment to correct the subluxation is the art of chiropractic. It is an art that takes experience and training to hone, but what a difference it makes to be under such care. 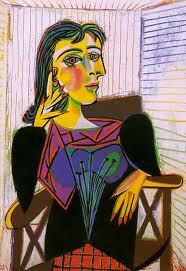 A good chiropractor can tell if you are a subluxated Picasso or a peaceful Monet. The human spine is made up of 24 movable bones called vertebrae – the canvass for your chiropractic artist. Your adjustment is where the science and art meet. 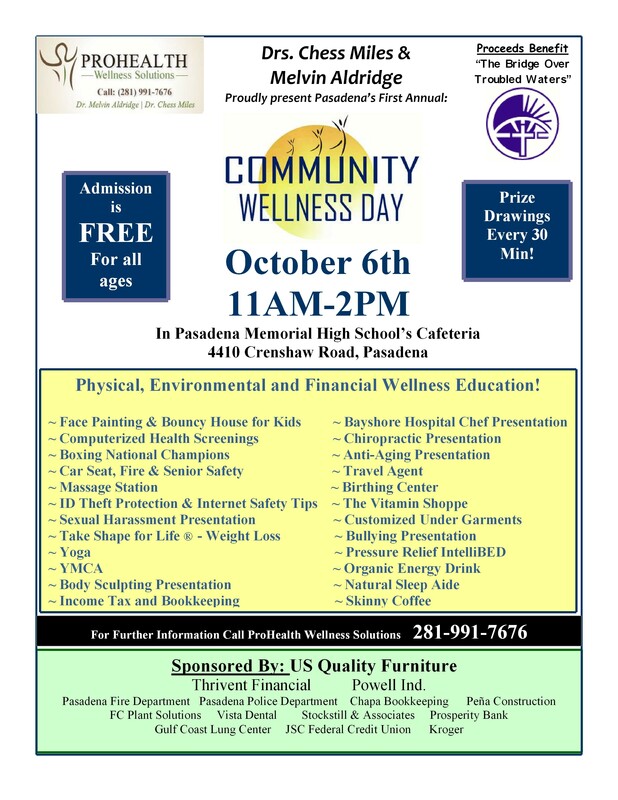 The Mayor of Pasadena, Mayor Johnny Isbell, has issued a proclamation that October 6, 2012 is Community Wellness Day in the city of Pasadena. On Sunday, September 30, 2012, the local newspaper The Pasadena Citizen honored our event by putting us on the front page, spotlighting the importance of increasing health awareness in our community. So be sure to come check us out at the Pasadena Memorial High School this coming Saturday, October 6 from 11 AM to 2 PM! We look forward to seeing you there! This July 4th we are thankful for the courageous who signed the Declaration of Independence in 1776. We are thankful for the courageous who have served in peace & war to protect America ever since! Happy July 4th to everyone! As we celebrate our country’s Independence Day, I thought of the famous painting of George Washington crossing the Delaware by Emanuel Leutze (1851). George Washington is portrayed as standing in the boat with the American flag waving in the wind. 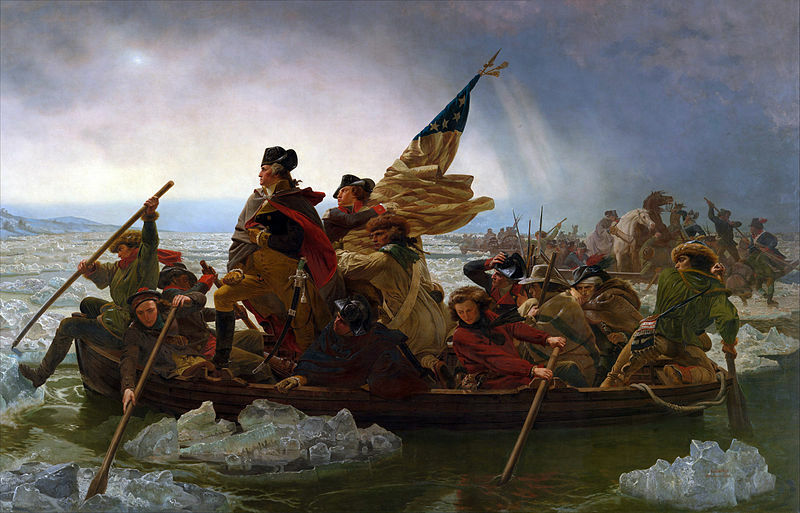 The painting may not be historically accurate – the type of boat used, the river in December would have had ice chunks, the flag depicted was not used until later, and standing in such a boat would have surely resulted in the future President overboard. Yet the artist was accurate in rendering the historicity of emotion – the “spirit of 1776”, a portrayal of courage. On Christmas Day in 1776 morale was very low for the people of the American colonies. Washington’s surprise attack and victory against three regiments of Hessians at Trenton by making this crossing of the Delaware, gave the people a tremendous psychological lift. Years later, Leutze, by painting George Washington standing, portrays leadership that inspires courage in overwhelming circumstances. Though the odds were stacked against George Washington, he had the vision to lead forward and expand that vision to others. That kind of leadership is needed today. We all live in a circle of influence with others who are searching for that one who is standing courageously – whether it be in our community, business, or home. How are you impacting others? Consider how you can be that leader today that inspires courage. One way to impact others is to join in supporting PROHEALTH Wellness Solutions in “Community Wellness Day”, October 6, 2012. Please contact our office (281-991-7676) or email us at cwd@prohealthwellnesssolutions.com for more information or for ways you can help.